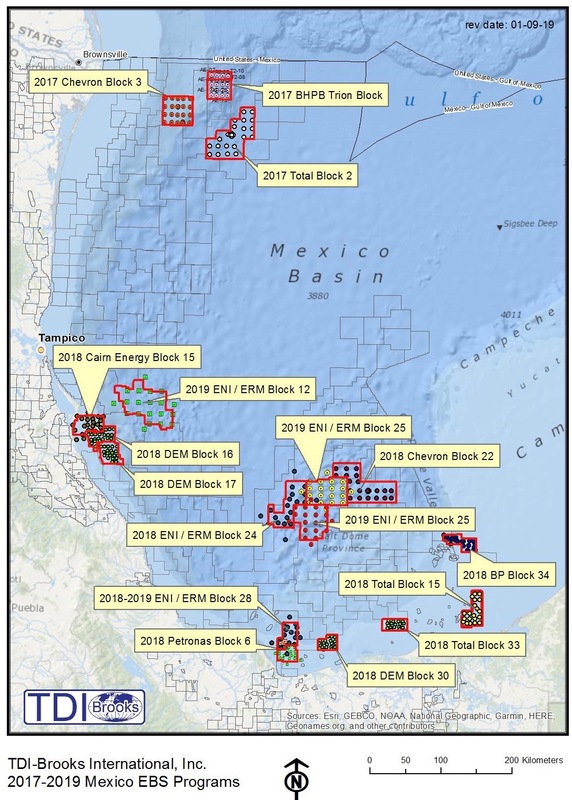 Below is an early January update on TDI-Brooks’ activities focusing on vessel deployments/availability for GoM/Mexico, Northern South America (NSA) / Caribbean / Brazil and NW/W Africa regions for seep-hunting, geophysical, geotechnical, environmental baseline survey (EBS), metocean, cable route, wind farm and vessel charter projects. Our last similar update was August-18. MV LAGUNA AZUL is available for projects in Mexico in early February and periodically thereafter. R/V PROTEUS is headed to Guadalupe in the Caribbean for a cable route survey. It is available for projects in Feb. in the Caribbean/NSA region. It will likely return to Brazil and be available there for other projects in the 2nd/3rd Qtrs. R/V GYRE is in NW Africa on a TGS multiclient MBES/seep hunting project until early 3rd Qtr. It is currently available for other projects in Africa in the 3rd/4th Qtrs. R/V BROOKS McCALL (BMCC) is available for projects in the Gulf of Mexico or the US East Coast starting mid-February. This year, TDI-Brooks has continuously in Mexico been conducting EBS surveys for Total (2 blocks); Chevron; BP, DEA-Grp. (3 blocks); Cairn Energy; and ENI/ERM (2 blocks). Currently we have three (3) additional blocks of EBS work underway for Petronas through ERM. The figure below shows TDI-Brooks’ EBS project history in Mexico. 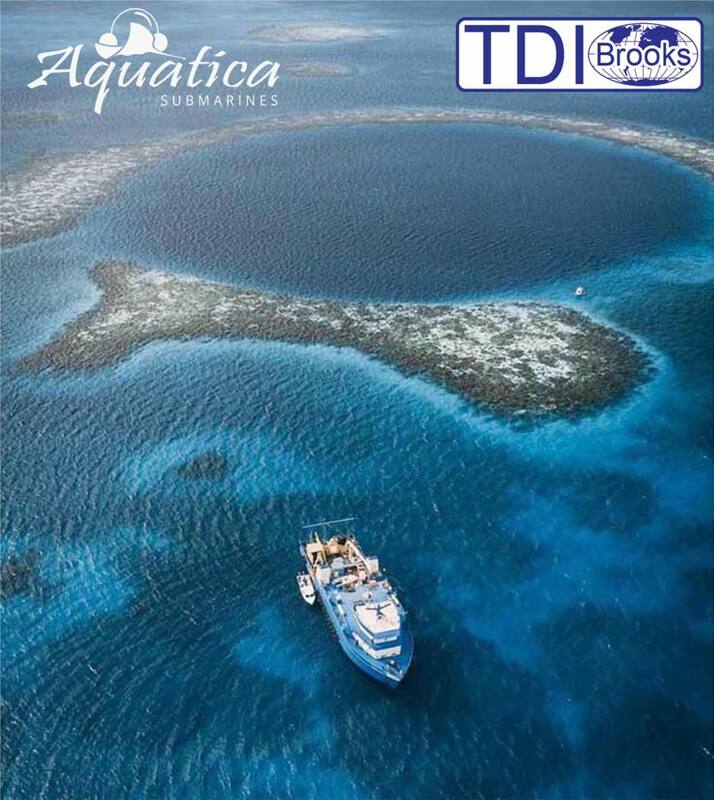 In 2018 TDI-Brooks conducted our Mexican EBS projects off the MV MARIS with TDI-Brooks’ technical staff and equipment. 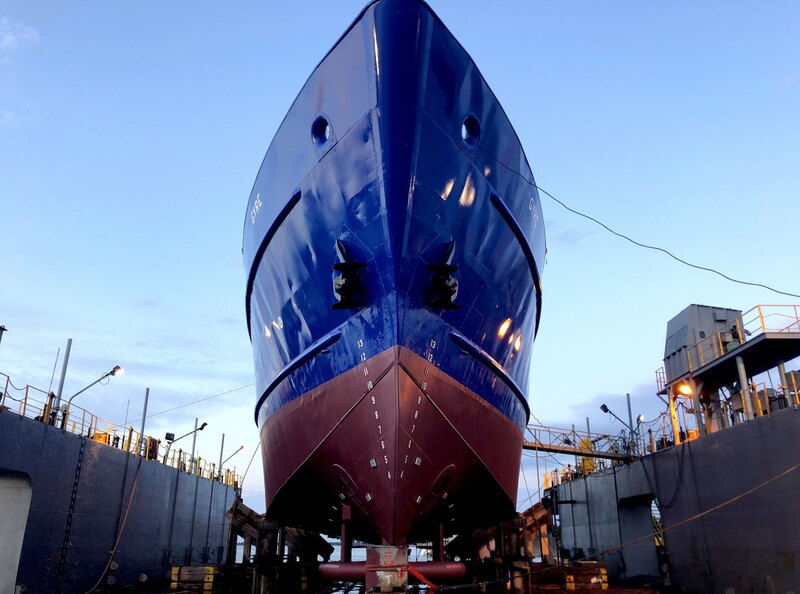 We now in 2019 have another Marinsa sister vessel mobilized, the MV LAGUNA AZUL, and available for programs in Mexico. Next availability is early February for EBS, geotechnical, AUV, survey and metocean projects. We currently have several projects ‘in play’ in the 1st/2nd Qtrs. but have periodic availability starting in February. TDI-Brooks has conducted more EBS projects over the last two (2) year in Mexico than any of our competitors all safely and efficiently without any incidences. TDI-Brooks remains focused on the planning, acquisition and analytical components of these ASEA required EBS projects. We team with Maxon Consulting who provides the regulatory and interpretative reporting components. 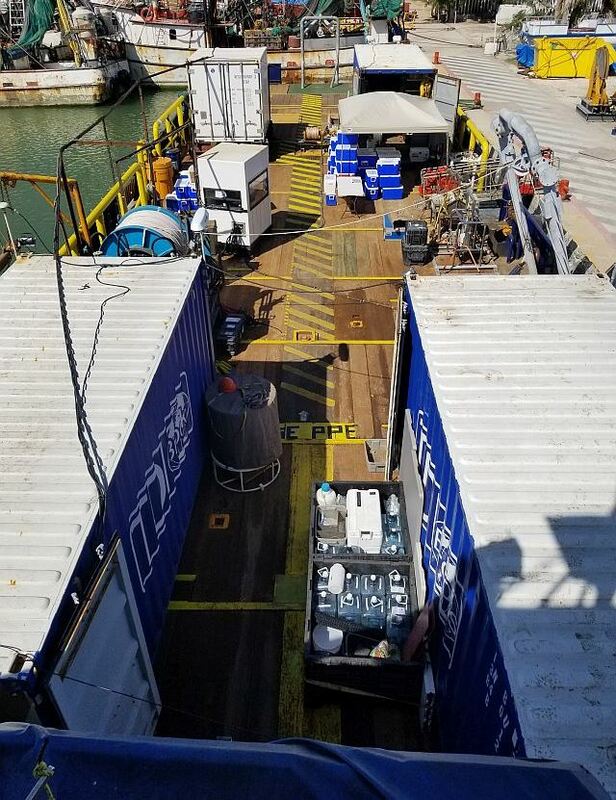 To give you an idea of the back deck configuration of our equipment off a 3rd party vessel, below is an image from the MV L. AZUL showing lab, office and storage vans, stern and port-side A-frame, winches, pole-mount for USBL, etc. TDI-Brooks’ 2D HR site survey kit (i.e., compressor, air-gun & streamer) with surveyors have been in Mexico for about four (4) months in the second half of 2018 as a subcontractor to Oceaneering on a large PEMEX site survey project. TDI-Brooks can provide a complete analog and 2D HR kit on the L. AZUL. As well, TDI-Brooks has the L. AZUL outfitted for ‘light’ geotechnical coring (6-m PC, BC and g-CPT), although we have projects bid that would outfit the vessel for 20-m Jumbo Piston Cores (JPCs), 40-m CPT-Stingers and Stinger Samplers for deep-water development engineering studies. TDI-Brooks has several vessel options to acquire EBS, geotechnical, survey, metocean and other services in Mexico. Please let us know if we can assist you with your awarded blocks. The GYRE over the last quarter completed its 5-yr ABS LL/class shipyard period in Pt. Arthur, TX. The GYRE is currently in Senegal conducting for TGS a 5-month long multi-client MBES, surface geochemical exploration (SGE) and heat flow (HF) project consisting of ~115,000 km2 of MBES, 230 PC and 23 HF & JPC sites. 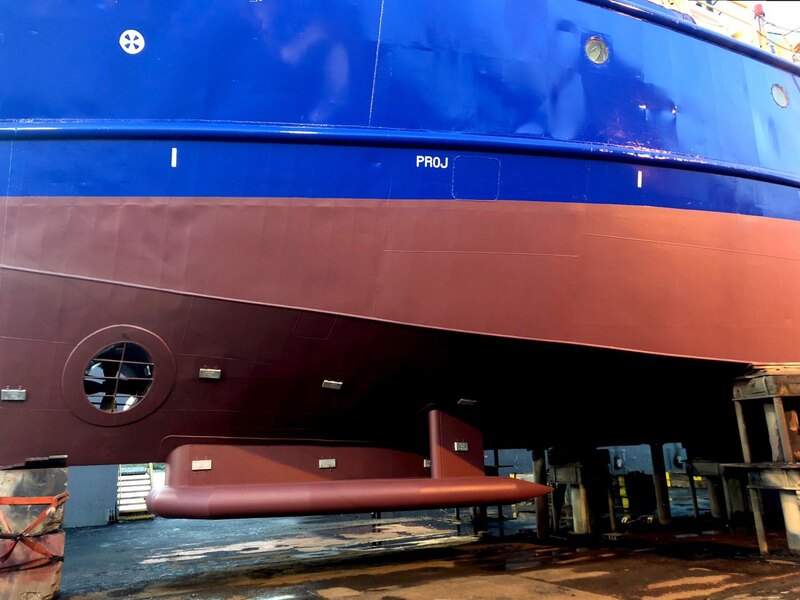 We are pleased to announce the installation of a new hull-mounted EM-304 MBES on the GYRE. The modular, state-of-the-art EM 304 performs accurate, high resolution seabed mapping in shallow to deep waters at depths of more than 8000 m. The successor to the EM 302, the EM 304 has a broad range of functionality for seep hunting and cable route projects. Below are pictures of the MBES/SBP gondola on the GYRE. The GYRE is also outfitted with the TDI-Brooks full geotechnical kit including 20-m JPC, 40-m CPT-Stinger and Singer-Sampler as well as other EBS, survey, cable route, metocean, etc. capabilities. The GYRE will likely remain in Africa through 2019 and available for other projects in the 3rd/4th Qtrs. The R/V PROTEUS has been working continuously throughout 2018 on a series of projects in Morocco, Brazil and the US. Since the last report in August, the PROTEUS completed Phase I of a 5 month-long MBES/SGE /HF project in Brazil for TGS arriving back in Texas in November. In December it acquired a geotechnical project for UPI-Pegasus and a SGE project for TGS (OTOS) in the Western Gulf. 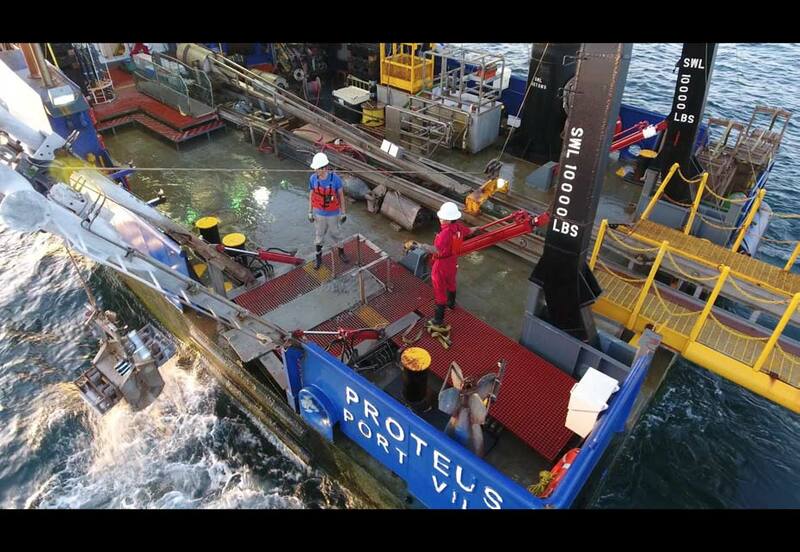 The PROTEUS will leave in the next two (2) weeks for a cable route survey for Geoteam in Guadalupe. The PROTEUS is available in the southern Caribbean/NSA regions in early February. Sometime in the 1st or 2nd Qtrs. she will likely return to Brazil for Phase II of the TGS multi-client seep hunting project and some other private projects. Thus, in the 2nd / 3rd Qtrs. she will be available for projects in Brazil. The PROTEUS is outfitted with TDI-Brooks’ complete geotechnical tool kit including 20-m JPCs and 40-m CPT-Stinger/Samplers along with other TDI-Brooks standard SGE, HF, survey, EBS, cable route, etc. services. The PROTEUS has a Kongsberg EM-710 (1×1) hull-mounted MBES for surveys to ~2,500-m wd. In early September, an approximately two (2) week-long cruise funded by BSEE through NOAA to study oil and gas being released from the former Taylor Energy platform lost during a hurricane in MC Blk. 20 off the Mississippi Delta. 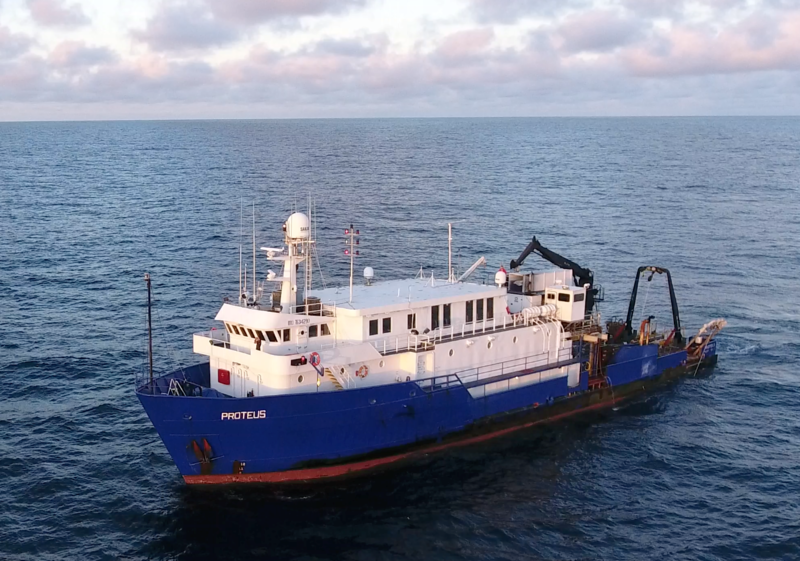 The project involved ROV and geophysical studies of the oil and gas plumes with sediment, water and air sampling with 30 scientists/technical onboard from NOAA, BSEE, Florida State, FIU and TDI-Brooks. Below is a drone picture of the BMCC showing the Seatrepid ROV LARS on its back deck. In October, a ~2-week cruise out of Charleston, SC as part of TDI-Brooks’ BOEM-funded DEEP SEARCH project. Starting in late October, a month-long Colt pipeline survey and geotechnical project for UniversaI Pegasus off Freeport, Texas. Starting in late November a nearly month-long deployment to Belize for a Discovery Channel submarine expedition to the “Blue Hole”. The BMCC is currently conducting a 3-week long seismic testing project for Ion Geophysical. In late January, TDI-Brooks will conduct with the BMCC a ‘heavy’ geotechnical project for LLOG at the King’s Quay development in the central GoM. The BMCC’s primary market niche in the Gulf/US East Coast is geotechnical coring/CPT and survey acquisitions. The BMCC is available for pipeline hazard, cable route surveys, debris mapping, P-Cable, MBES, metocean, sand search, and environmental studies. TDI-Brooks has strategic alliances with a number of companies that allow us to offer complete engineering and environmental project solutions. We have a long-standing association with Geoscience Earth & Marine Services (GEMS) in Houston to support our engineering reporting in marine geology/geophysics, geotechnical engineering and marine archaeology projects. TDI-Brooks seep hunting programs are conducted as part of an alliance with ONE (Drs. John Decker, Dan Orange and Phil Teas) with world-class expertise in MBES and seep-site selection. On environmental baseline surveys, we team with Maxon Consulting to provide the regulatory, comprehensive environmental interpretation and infauna/meiofauna analyses. Through these strong alliances we can provide integrated solutions for geophysical, geotechnical, seep-hunting and environmental projects. TDI-Brooks also provides technical engineering and 3rd Party expertise. BOEM/NOAA Canyons II Project – TDI-Brooks is the prime contractor for the Bureau of Ocean Energy Management (BOEM), the NOAA Office of Ocean Exploration and Research (OER), and the U.S. Geological Survey (USGS) funded study entitled “DEEP SEARCH – DEEP Sea Exploration to Advance Research on Coral/Canyon/Cold seep Habitats.” This interagency five (5) year, multi-million dollar study focuses on the exploration and investigation of deepwater biological communities located in U.S. federal waters of the Atlantic Ocean (Virginia to Georgia). Results of the completed program, which includes numerous higher educational collaborators, will provide energy resource information needs for future offshore leasing of the Outer Continental Shelf in the mid and south Atlantic regions and information on the continental slope ecosystems. The mapping surveys were accomplished with the NOAA Ship Okeanos Explorer through coordination with NOAA OER. The multibeam mapping surveys and sampling was conducted in October on TDI-Brooks’ ship, the RV BROOKS McCALL including Jumbo Piston Cores collected at selected features of interest (e.g., mounds). We recognize that quality assurance requires a commitment to quality by every individual in our organization. As part of that commitment, TDI-Brooks’ laboratory (B&B Labs) began its accreditation process for ISO/IEC 17025 in January of 2018. After completing numerous third party internal audits we were accredited by A2LA in October of 2018 for ISO/IEC 17025 Testing/Calibration Laboratories for the following analysis: Polycyclic Aromatic Hydrocarbons (PAH), Alkylated PAHs, Selected Biological Markers, Aliphatic Hydrocarbons, Total Petroleum Hydrocarbons (TPH), Extractable Organic Matter (EOM), % Moisture, Total Organic Carbon (TOC) in non-potable water, and soil/sediment. 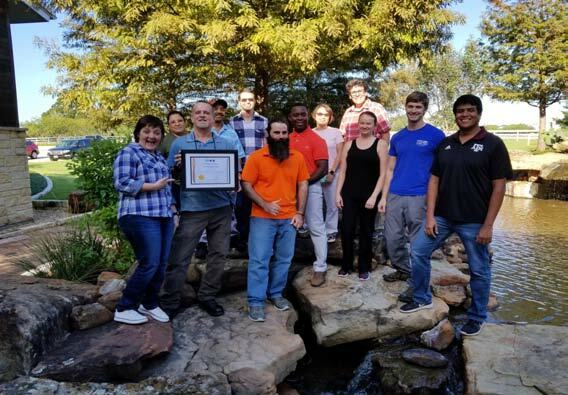 Below is a picture of some of our laboratory staff with this ISO-17025 certificate.